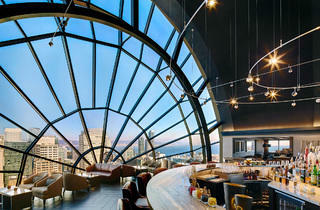 This 39th story bar atop the Marriott Marquis artfully frames the city in its arched, floor-to-ceiling window. 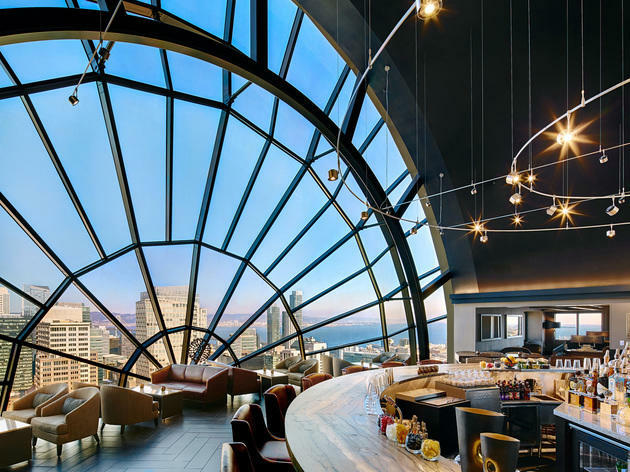 Though the décor is admittedly dated and the crowd can be touristy, even locals agree that this is one of the best barside views in the city. Seating is first come first served, so arrive early to stake out one of the coveted tables along the window. (Better yet if you arrive in time to catch the sunset.) The cocktails, served in low, round tumblers, are simple, strong and pricey. The namesake Marquis cocktail blends 209 gin, fresh citrus juice and Grand Marnier Cuvee du Centenaire (for a whopping $18), while the Golden Gate is a sugary mix of Jameson, St. Germaine, cranberry and ginger ale. Seeing the view here is definitely worth it! It was hard to find seating, but we managed it (around 9pm on a Sunday night). The drinks were pretty good and the staff were very nice (we chatted to our waiter for a bit). There are sofas by the walls and smaller round bar tables near the windows (they'll seat maybe 4 at a push), and there are larger tables in the middle of the room. It was a big space and there was quite a bit of seating, although the seating is spaced out so you don't end up hearing other people's conversations. The view is amazing - you can see so much of the city. We went at night when the city was lit up.